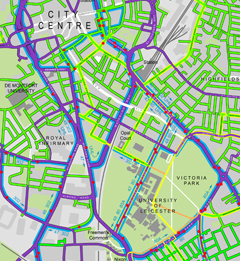 The outputs can be used for assessing cycle and pedestrian networks, as an input to active travels strategies or as maps for green travel plans such as that for Leicester University. TI also produced the map. 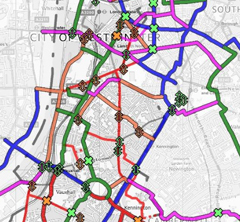 Knowledge of where sustainable transport assets are, and in what condition, is often poor. 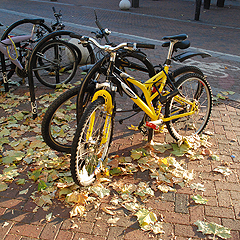 We have extensive experience of auditing a range of assets including cycle infrastructure, cycle parking and signing. Our work can provide baseline data upon which we can build robust proposals. On the left our assistant is measuring advanced stop lines in the City of London as an input to our review of their capacity. We can undertake the cycle and pedestrian aspects of safety audits at all stages of construction. 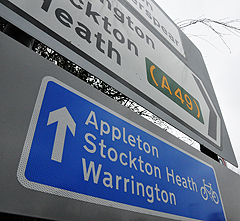 Most of our work has been for major roads and junctions including Leopardstown Road in Dublin and the A50 in Warrington. 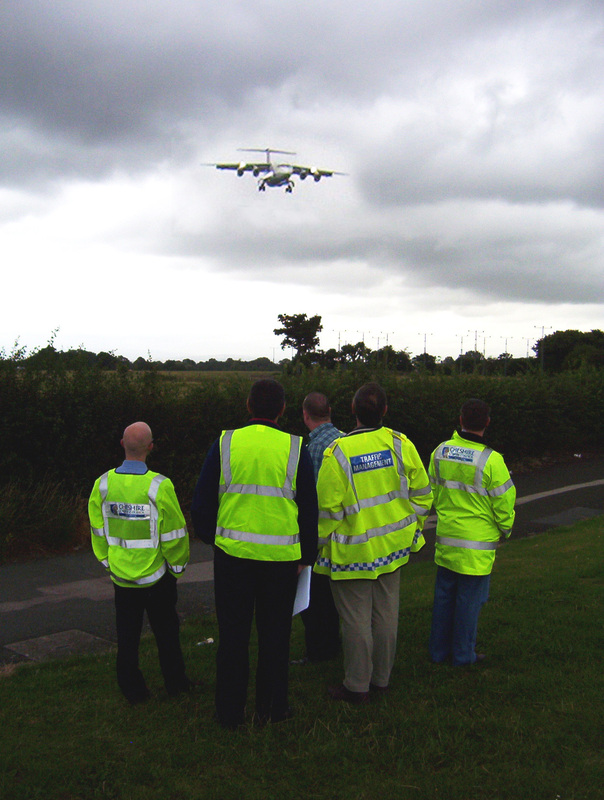 The picture shows the A6-Manchester Airport road team trying not to get distracted by passing aircraft. The scheme on the left was part of an exercise in removing a centre lines from lady Margaret road in Ealing. 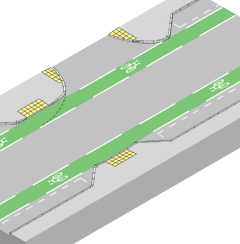 We have extensive experience of analysing existing and proposed networks, with particular experience of the most recent methodologies (TFL’s London Cycle Design Standards and the Propensity to Cycle Tool). Good wayfinding is vital to ensure the success of cycle or pedestrian networks. As well as auditing existing signing, we are able to devise both wayfinding strategies and design new signing schemes including location plans and sign face drawings compatible with TSRGD 2016. We have worked on dense urban networks and long rural routes. We have used conventional highway signing, more rural fingerposts, waymarks, produced colour coded systems and used elements of the "legible city" concept. A key part of providing for more cycling is ensuring safe and convenient cycle parking. As well as auditing existing parking, we have experience of developing programmes for new parking including recommendations on the best type of equipment. 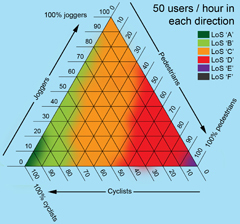 Cycle parking "Hubs" are a popular idea and we have made recommendations on these for both councils and universities. We have also producing guidance on how to address cycle parking in the planning process for a number of councils, many of which have adopted this as a Statutory Planning Document. 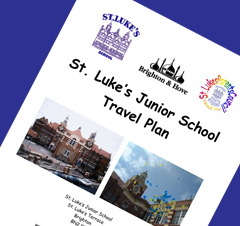 We have written Travel Plans for a variety of developments, particularly focusing on schools and other locations which are used by young people. We have also assisted organisations to implement their travel plans designing schemes to improve access, or parking, providing maps and travel information. One of our core strengths is a focus on the value of research and data, including writing the only English guidance on monitoring cycling. As well as guidance, we have carried out research on many issues including user interactions on shared paths, usage of cycle parking and ASL capacity.